THREE clubs have joined the drive to encourage more people to take up golf in Cheshire. Walton Hall, Altrincham and Vale Royal Abbey are all staging coaching programmes for would-be golfers. The free schemes are part of the county-wide programme to provide more opportunities for people to try the sport. Walton is running a Golf 4 Women session on July 13 with Golf 4 All coaching available on July 24 and August 28. Contact professional Paul Hodgson on paul@golfstorehousse.com for more details or to register your interest. The sessions at Vale Royal Abbey, near Northwich, start on July 21 with Golf 4 All from 1.30-2.30pm and Golf 4 Women at 3-4pm. Contact professional David Ingman on 01606 301291 option 4 for more information. HESKETH members are already living the Olympic dream – not the London Games but the one staged in Munich in 1936. For the club has purchased the Hitler Trophy at a Chester auction. How it arrived originally at the Southport club is a well-documented story but worth repeating. The Berlin Games are remembered for the manner in which the host nation attempted to hijack this great sporting festival as an instrument for propaganda. 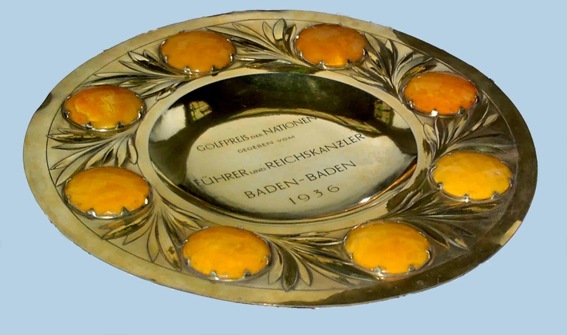 Jesse Owens’ four gold medals rather stymied this attempt so a bid to salvage some sporting pride was made at the Great Golf Prize of Nations played in Baden-Baden, two-man team event for an impressive brass salver inlaid with eight large amber discs trophy, donated by Hitler. England were represented by Hesketh’s Arnold Bentley and Yorkshire man Tommy Thirsk. After three rounds the German team enjoyed a three-stroke lead and Foreign Minister von Ribbentrop, who was representing Hitler at the championship, rashly notified him of an imminent home victory. Hitler immediately set out for Baden-Baden to enjoy the German triumph and to present his trophy. But the English team won by four shots and Ribbentrop intercepted Hitler and to convey the bad tidings. He was furious at being denied the opportunity to celebrate a German victory and ordered his chauffeur to return to Berlin. The salver became the property of the English Golf Union who then presented it the Golfers’ Club whose assets went into private hands when it became defunct. Hesketh members had long believed that their clubhouse was probably the most appropriate destination for it and they finally secured it at the auction. It now takes pride of place in the club’s Bentley Room along with the other silverware donated to the club by Arnold’s son Robert. 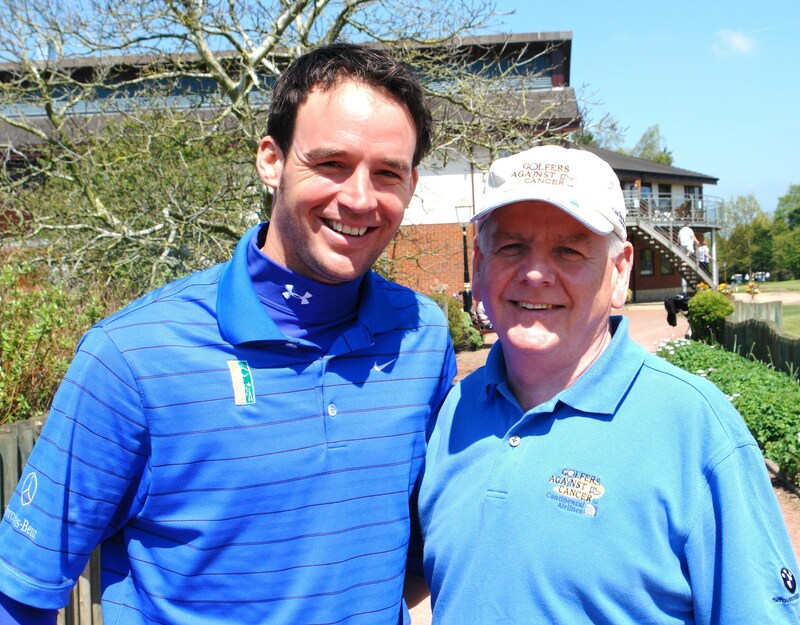 MATT Jansen, the legendary Blackburn Rovers striker who is assistant to Chorley FC boss Garry Flitcroft, was just one of the sporing stars to support the 10th annual Rosemere Golfers Against Cancer Charity Celeb-Am Day at Leyland. Manchester City player Gary Owen those playing in the evnt for the first time while regulars Alex Stepney and Arthur Albiston (ex-Manchester United) and David Lee and Peter Nicholson (former Bolton Wanderers) also joined the competition. Former European Tour winner Paul Eales, a long-standing patron of RGAC, set up a coaching clinic before joining the competition. The Leyland event is now well-established in the local sporting calendar and it was again well supported by the business community and Leyland b members. In the evening, Norman Prince hosted the presentation dinner and fellow patron Lora Fairclough, a four-time Ladies European Tour winner, presented the prizes and Gary Marshall filled the after-dinner comedy slot. From the world of entertainment, singers Stephen Bayliss and Tabu Duo (Andrea and Tony Robinson) accompanied comedians Terry Cotta, Gary Marshall and RGAC patron Norman Prince into the fray. The Rosemere Cancer Foundation is based in the Radiotherapy Department at Preston Hospital. RGAC is the official golf fundraising group, funding cancer care throughout Lancashire and Cumbria. In 2011 handed over a cheque for more than £12,000. Chairman Keith McIntosh said: “We couldn’t have asked for a better day for our golf event. I’m delighted with the way everything has turned out. Once again, we’re grateful to the ‘celebs’ and all our supporters for making things like this happen.”For further information on Rosemere Golfers Against Cancer, contact Keith McIntosh on 01772 462685. Meanwhile, you can play alongside Matt Jansen and Garry Flitcroft playing in the Chorley FC Golf Day at Shaw Hill on August 20. 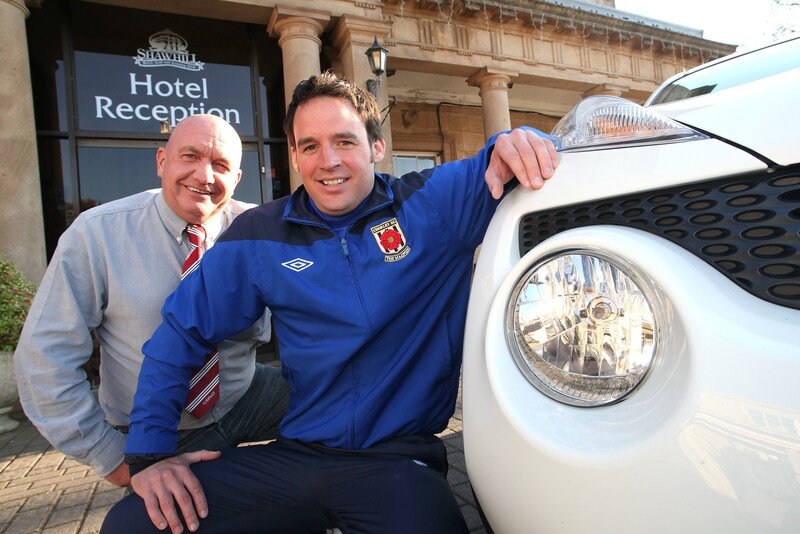 Log on to chorleyfc.com for details. 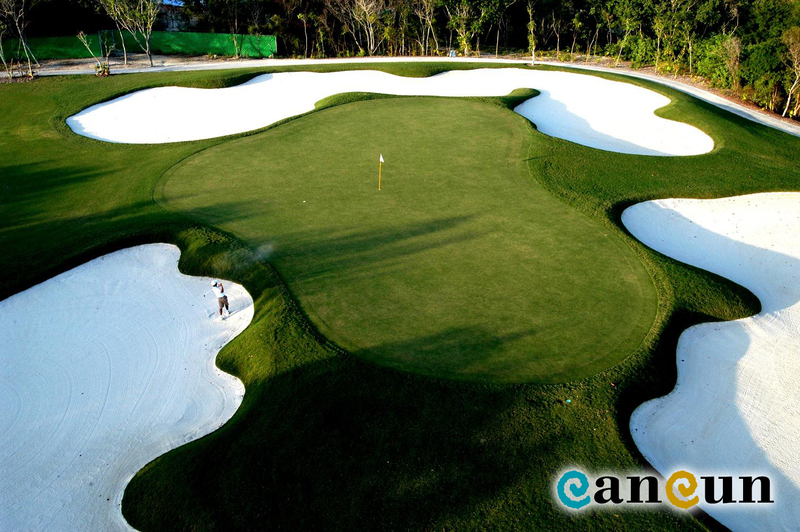 A TEMPTING slice of tropical paradise at Mexican hotspot Cancun awaits the golfers who qualify for the Grand Final of this year’s Virgin Atlantic PGA National Pro-Am Championship. The stunning Moon Palace Golf and Spa Resort is the venue for the 36-hole event, which will be staged from December 4-8 and is supported by SkyCaddie and BMW. Located right on the Cancun shoreline, Moon Palace is home to a 27-hole Jack Nicklaus Signature Design golf course where 16 PGA professional and amateur teams will contest the £30,000 final. Qualification for the event is earned through the 16 regional finals being staged across the UK with the first one at St Annes Old Links on June 6 then another in June 29 at Dunham Forest. Annually more than 750 golf clubs contest the series, which is Europe’s largest pro-am. PGA head of tournaments Simon Higginbottom said: “The PGA is delighted with the continued support of Virgin Atlantic for this prestigious event and Moon Palace Golf and Spa Resort is another fantastic grand final venue. Cancun is one of three new destinations for Virgin Atlantic who fly to 35 of the world’s most celebrated golfing destinations and do not charge golfers extra for transporting their clubs. Moon Palace’s impressive facilities include seven swimming pools with swim up bars and 13 restaurants while Cancun’s international reputation, including being the location of the world’s second largest barrier reef, has it earmarked as a must see destination. The PGA National Pro-Am Championship is now its 28th competitive year with the award-winning Virgin Atlantic long haul airline sponsoring the event for the fourth successive season. The winning professional at the Grand Final will take home a cheque for £5,000. THERE should be plenty of birdies at Shaw Hill Golf and Country Club this season. But on August 20 some of them will be Magpies! spikes and hopefully invite some of their soccer pals to join them. And you can swing along with them and help to boost the club’s finances. Apart from promising a “hole” lot of fun, there’ll be lots of prizes up for grabs – including a fabulous Nissan Juke car! It’s been generously provided by Victory Park stadium sponsor The Chorley Group who will hand the keys to the first player to ace a nominated par three hole. If you want to join in the action you are advised to book your place as soon as possible the event is limited to 24 teams of four players comprising men, women or mixed. The format is the popular stableford system with the best two scores on each hole counting and because there’s a shot-gun start everyone will finish their rounds at the same time. Shaw Hill, which also supports the Magpies, has reduced the price of a team to £350 (VAT ex) that covers green fees, bacon sandwiches and tea or coffee on arrival, and a three-course evening meal and prize presentation. You can enter on line at www.chorleyfc.com/golfday where you will also find more details on the day or by picking up a form from the club office at Victory Park. Extra guests for the evening meal, at 6pm, are welcome at a charge of £20 a head. IT’S a wonder nobody thought of it before but former European Tour player Andrew Murray has patented a device that saves time looking for a lost ball.“It’s a simple idea which also ensures you play within the Rules of Golf,” he said. “You can’t just estimate five minutes. I remember competing in the third round of the British Senior Open Championship at Muirfield in 2007 when my playing partner lost his ball at the first hole. Murray’s 5 Up Timer ends all the doubt and confusion by counting down the minutes. “It takes away the guesswork which can create animosity in the game, whether it’s in a tour event, county team match or club medal competition. Murray took a few of his timers to an inter-county match between Cheshire and North Wales at his club Lymm. “Nearly every player in the visiting team had a story to tell about how they should, or shouldn’t have won a game. In one tie, an opponent was given a bit more time to find his ball, which he did, and went on to win. 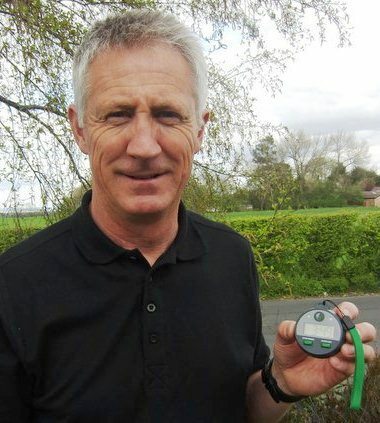 Murray and two of his clubmates have launched the device which is available online at 5upgolf.com and costs £12.99 including VAT and P&P. Meanwhile, he points out that the time starts when the player, partner or caddie starts to look for the ball. “It’s a much flaunted rule and my clock ensures it’s not broken,” he added. JOHN Watson, whose 10-year-old daughter Amy lost her battle against brain tumours last month, has decided to go ahead with his annual charity event at Styal on June 21. The former North Region captain has raised nearly £100,000 for deserving causes in less than four years after Amy’s condition was first diagnosed. Launched in 2009, the Amy Watson-Wright Charity Golf Day went from strength the strength with a massive £42,875 being realised last year – almost £18,000 more than in 2010. This year’s is already a sell-out and broadcaster Chris Evans has offered to repeat his gesture of inviting the winner of an auction to appear on his Radio Two morning show and play a round with him at Wentworth. Beneficiaries will be the Childflight, which provides flights and holidays for sick and deserving youngsters, and When You Wish Upon a Star, whose primary aim is to grant the wishes of children between the ages of two to 16 suffering from life threatening illnesses. Meanwhile, log on to: justgiving.com/amywatsonwright-charity-golf-day-2012 to make a donation. You can also donate by texting AMYW77 £5 to 70070. 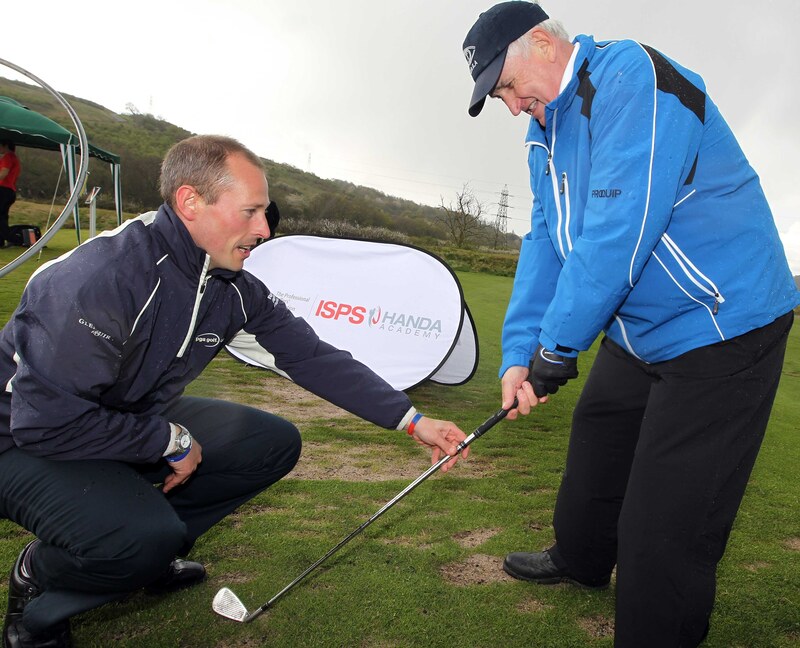 THE first lessons of a ground-breaking initiative to help more blind and disabled golfers receive coaching were delivered at Celtic Manor – host venue for the ISPS Handa Wales Open from May 31-June 3. PGA professional Craig Thomas, the first to be trained on the programme, coached four golfers, including Celtic Manor club captain and amputee Richie Willis, as part of the ISPS Handa PGA Academy Programme which is equipping PGA pros with the skills to specialise in giving high quality coaching sessions to golfers with disabilities. “It’s wonderful to see an initiative like this bringing more disabled people into golf,” said Celtic Manor club captain Richie Willis, who wears a prosthetic leg as the result of a road traffic accident 12 years ago. “I’ve only had one golf lesson in my entire life so it’s great to know specialist tuition for disabled golfers will now be made available. Also receiving instruction were Ron Tomlinson, who is totally blind and started England and Wales Blind Golf 30 years ago, alongside Camarthen Golf Club’s Chris Evans and Derrick Sheridan from Wargrave near Henley on Thames – a member of Badgemore Park and Castle Royale golf clubs. Tomlinson, who gave up golf after losing his sight before being inspired to start again by an American blind golfer, benefited from some advice from Thomas. “I was leaving the club face open so Craig worked on turning the club face by physically taking me through what I was doing,” said Tomlinson. Sheridan added: “The ISPS Handa PGA Academy Programme is a great initiative. We want more visually impaired people to join us at England and Wales Blind Golf and we always want more players, particularly younger ones. The academy programme is being backed by leading Japanese philanthropist Dr Haruhisa Handa whose long term ambition is for golf to become a Paralympic sport. As part of its support of the academy programme, ISPS will also be enabling new trained PGA professionals to provide a thousand free golf lessons for blind and disabled golfers to encourage them to think about either taking up the game of golf, or continuing to develop their golfing skills. The first stage in this programme has been to train a number of PGA professionals as tutors to deliver the training workshops that will be rolled out over the coming months. Dr Handa, who has been supporting blind and disabled golf for more than 25 years, was delighted to see the first lessons being delivered in the name of the ISPS Handa PGA Academy Programme. Dr Handa also appreciates that the skill and expertise of PGA professionals like Craig Thomas would be a major asset in helping blind and disabled golfers enjoy the game to the maximum. Thomas from The Golf Academy in Wolverhampton said: “The ISPS Handa PGA Academy is the first step in increasing awareness of coaching opportunities for people with disabilities. “It is an opportunity on two levels – to raise awareness among disabled golfers and also PGA professionals that there are demands for more coaches to deliver their skills. THE funeral of 10-year-old Amy Watson-Wright will take place St Ann’s Church, Cheadle Hulme, on Monday, April 16, at 11am. The service will be followed by a celebration of the life of Amy, who died four years after being diagnosed with a brain tumour, at Styal Lodge, Station Road, Styal. The family request flowers from family only but donations for Amy’s charities can be made on the day or via link below. AMY Watson-Wright has lost her brave battle for life. She died yesterday aged 10 after being diagnosed with a brain tumour four years ago. 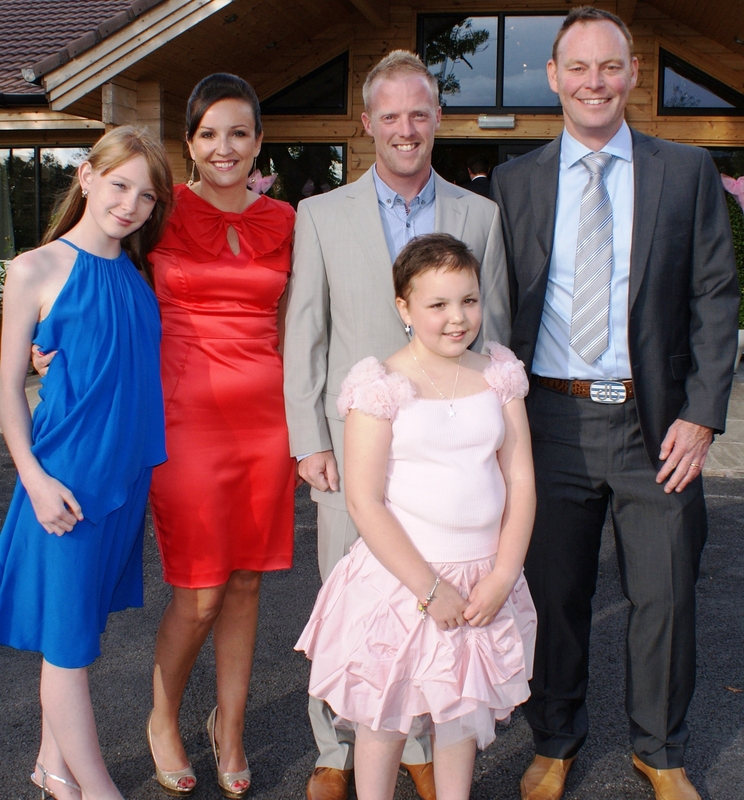 John and his wife Lydia, who have an elder daughter Megan, have raised nearly £100,000 for children’s causes since Amy’s first charity golf day at Styal in 2009. The event went from strength the strength with a massive £42,875 being raised last year – almost £18,000 more than in 2010. Beneficiaries have included Childflight and which provides flights and holidays for sick and deserving youngsters. IT’S great to learn that new golfing nations – spread between South and Central America, the Caribbean and the Far East – benefit from a joint initiative between The R&A and the PGAs of Europe to help their fledgling golf cultures to adopt best practices as they grow the game. The number of countries receiving such aid is now past the 50 mark and it is all funded by R&A surpluses from the staging of The Open Championship. Much less satisfactory is the news that from 2013 the BBC is pulling out of showing any live action from the European Tour. Only the Open Championship and the Women’s British Open will remain in the BBC’s exclusive live golf portfolio next year, the Corporation having surrendered the rights to the Aberdeen Asset Scottish Open and the BMW PGA Championship to Sky Sports in the new European Tour TV deal. There are reports that Lee Westwood and Luke Donald have expressed their “extreme disappointment” at this news, especially when British golf is going through such a boom. • A one-day, Get into golf experience at Canary Wharf in London on Thursday, 12 April, when all-comers will have the chance to hit drives and hole putts. Richard Flint, England Golf Development Manager, said: “Golf is a great game for people of all ages, backgrounds and abilities – and there’s never been a better time to start. Get into golf is launching at a time when interest in the sport will be at a high, thanks to the US Masters, the first Major tournament of the season, which will be played from April 5-8. Pro-ams – it was Bing Crosby who called called the tune! 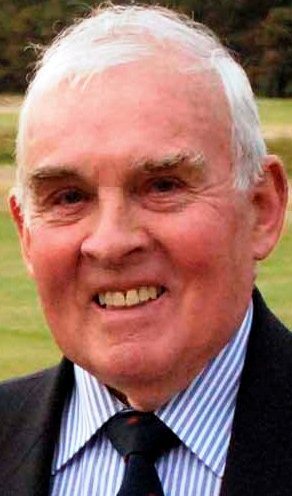 MICHAEL YATES, a former President of the Lancashire Union of Golf Clubs and a member of Dunscar Golf Club, delves into the archives to reveal how pro-am and am-am competitions evolved. THE pro-am and am-am are two forms of competitive golf which are still very popular today and are played in many countries throughout the world. When first devised, PGA professionals would be partnered by either top amateurs, sportspersons, entertainers or businessmen. A prize fund was set up for the professionals and golf equipment for the amateurs. Those who benefit from these events are the professionals, charities and the host club. Soon, they became so popular that national newspapers, travel companies and charities began to organise large national events which provided financial rewards and entertainment for all concerned. I often wondered when and who started these unique and most popular tournaments. I’ve now discovered that in 1937 Bing Crosby had an idea of a friendly golf tournament to help the lads struggling on the professional tour. He invited the West Coast professionals to partner his golf-crazed show business buddies in a 36-hole better ball event. It would be a perfect excuse for a non-stop party – a stag weekend at the beach – and raising some money for charity. Bing, a single figure golfer his whole life, who qualified for the US and English Amateur Championships, and won his club championship five times at The Lakeside in Hollywood. He often talked about his hole in one at Cypress Point on the 16th 219 yard par three. In 1978 he and Bob Hope were presented by the US Golf Association with the Bob Jones award for distinguished sportsmanship.The first pro-am was held at Rancho Santa Fe Golf Club. Opening round was cancelled due to non-stop gales off the Pacific. Bing grilled steaks, sang songs and mixed drinks which flowed like the Ganges. The winner was 25-year-old Samuel Jackson Snead who pocketed $500. This was the beginning of the pro-ams. They later became known as The Clambakes. Nobody knows why, clams were never on the menu. The king of pop had invented the celebrity pro-am. The second “clambake” was won by a struggling 25-year-old Ben Hogan. Among the celebrities were 34-year-old vaudevillian Leslie “Bob” Hope, Johnny “Tarzan” Weismuller, Dean Martin and top amateur Eddie Lowery. Bing organised his next tournament at three remarkable courses – the Monterey Peninsula, Cypress Point and Pebble Beach. The US PGA objected and threatened to withhold their support but he was happy to go it alone and pay out of his own pocket. Following the horrors of war, the “clambakes” satisfied the post-war hunger for grown-up celebrities’ high jinks. Dwight Eisenhower professed his love of the sport and frequently competed. It soon became a spectator sport, watching your favourite entertainer “shank” golf balls into the Pacific, having been well lubricated with bourbon, whisky and brandy. The “clambake” offered everything to the privileged participants, everything apart from a good night’s sleep. Bing would annually revise his list of 168 invitees, one of the most guarded secrets in Hollywood. His rules were absolute. Amateur handicaps were dispensed with. He would assess each man’s handicap then allocate strokes as he saw fit. You either accepted this or you would be banished for life. Bing died in 1977 on the 18th hole of a golf course in Madrid. A SUPREME individual fundraising effort by one enthusiastic golfer has given a local golfing charity a fantastic boost. Nick Pedley, who hails from Hoghton and captains the BAe Systems Golf Society at Samlesbury, handed a cheque for £1,200 to Rosemere Golfers Against Cancer at Leyland Golf Club recently. He single-handedly, organised a Grand Charity Night, with cabaret, disco, raffle and golfing auction. The sell-out event, staged at the BAe Systems Canberra Club raised the impressive sum of £2,400 which Nick then divided between RGAC and St Catherine’s Hospice. Computer scientist Nick, 49, explained: “I regularly get involved with fundraising but was amazed how this took off. I particularly wanted to help the cause of Rosemere Golfers, they are a great group and do a terrific job. I am really grateful to everyone who helped make the evening such a success, particularly the many local golf clubs who donated auction items, the band Freeway and DJ Yamo. John Allott, Rosemere Golfers Against Cancer men’s captain and a member at Leyland Golf Club, was delighted to accept the charity cheque from Nick. The Rosemere Cancer Foundation is based at Preston’s Sharoe Green Hospital and relies almost entirely on the strering efforts of voluntary fundraising groups such as Rosemere Golfers Against Cancer and determined individuals like Nick Pedley. Dan Hill, Area Fundraising Co-ordinator for East Lancashire, was also present to receive the cheque on behalf of Rosemere. WITH a pedigree stretching back more than 100 years, the 2012 version of the Golfer’s Handbook provides all the information and statistics you can possibly digest. In addition to a comprehensive listing of past and present results for leading professional and amateur events the book includes entertaining and provocative articles by top writers on last year’s events and personalities. There is a section on the revised Rules of Golf, a who’s who of past and present players, a special chapter devoted to Seve Ballesteros and detailed entries on 5,000 clubs and courses in the UK and Europe. Golfer’s Handbook, edited by Renton Laidlaw, is published by Macmillan on February 23 and costs £30. LEADING mind coach Karl Morris is inviting fellow PGA professionals to a sports psychology seminar at De Vere Mottram Hall on March 12 (7pm-9.30pm). Tickets cost £25 and £45 for a pair but for the price is cut to £15 for professionals and free if they bring along four or more paying guests. Manchester-based Morris needs no introduction. His clients are a who’s who of the golfing world including four recent major winners – US Open Champion Graeme McDowell; Open Champions Darren Clarke and Louis Oosthuizen and US Masters winner Charl Schwartzel along with former world No 1 Lee Westwood to name but a few. Morris, a former Heaton Park pro, only delivers around a dozen or so of these workshops each year in the UK so this is a rare opportunity to hear one of the most respected psychologists in golf. It doesn’t matter what handicap or skill level you are – from scratch golfer to 36 handicap. Everyone can learn something. The event has been approved by PGA HQ and is accredited with 15 CPD (training) points for professionals who attend.